Stylish custom messenger bags in leather are perfect to use as a custom travel bag, shoulder bag, and as a purse. Create a custom-made messenger bag using your photos, text, and designs using our simple online design system. Bring an element of smooth style to your wardrobe or buy him a gift to remember with this sleek personalized man bag. It really makes it a personal gift when you can personalize the bag how Bags of Love allows you to. Fast delivery and good quality. Happy with this product. The customer care was very good. This was my first order from Bags of Love. I am very pleased with how my designs on the products look. The emails I received regarding the changes in the order were concise and provided clear solutions to the problems. I will definately order again from Contrado Bags of Love. I am absolutely thrilled with my messenger bag. It turned out even better than I expected! The quality is perfect, the picture looks even better on the bag than in my photos! I placed the order on Sunday and it arrived on Wednesday, the turnaround time fantastic! Ready to place another order :-) Thanks so much! This stylish bag is done in a messenger-style but is perfect for use as a personalized men's shoulder bag, personalized travel bag, and custom purse. The spacious large compartment is perfect for storing a tablet, books, a wallet, and any accessories you might also carry. There are 3 secure zip-close pockets for the safe-keeping of smaller accessories. Made from high-quality black Italian Nappa leather with a soft Suede Vision fabric interior, we print your custom design onto the bag's premium textured canvas. Our premium leather shoulder bags look great and feel great. They are useful for travel, a purse, or men's shoulder bag. 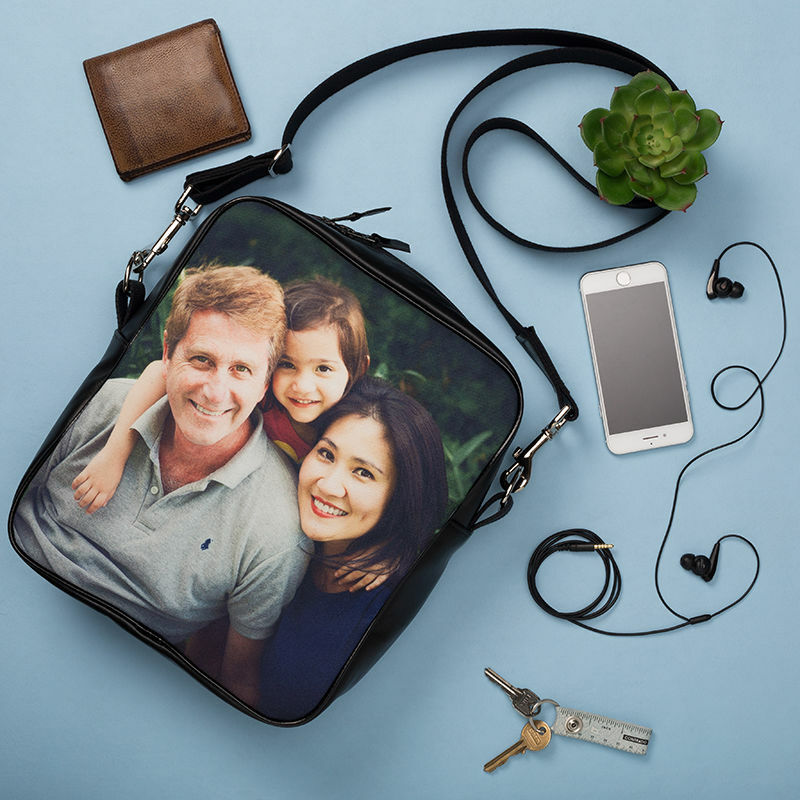 Customize your shoulder bag with photos, design, and text for a uniquely personal touch using our simple online design system. If your man has too many things to fit in his pockets, but not enough to fill up a bulky backpack, this messenger bag is perfect for him to use while not letting it look like a purse. This messenger bag is also perfect to use as a custom travel bag - put all your essentials (wallet, passport, boarding pass) in this personalized travel bag to keep them safe and close. With 3 secure zip-close pockets, your belongings will be safe from pickpockets while in the hustle and bustle of airports, train stations, and walking around foreign cities. This small, functional purse is great for those days you don’t want to use a bulky handbag. It will keep your tablet, wallet, and all your other little knick-knacks safe and sound. All of our personalized messenger bags are handmade to order. Your photos or design are printed onto the leather using a specialist process. We then cut and handcraft the fabrics to create a bag that is unique to you. Bold, chunky designs bursting with color work well with the Nappa on our personalized messenger bags. The photo area is on the front only but if you can’t choose just one image, create a bespoke photo collage with all your favorite snaps, no minimum order amount required. For a quirky creation, print your favorite book or movie cover. This is a great way to show the world your personality and what’s more, you could even make a new friend on the train who shares your interests! Our personalized messenger bags are so versatile, so if you’re heading to the Costa del Sol, take them as hand-luggage custom printed with your favorite holiday or honeymoon photo.